1. Have students write their names on their papers the French way (SMITH John). I believe it was my cooperating teacher when I was student teaching who first suggested this to me. 2. Lots of students like to listen to classical music while they are working on a test. Play some Debussy, Ravel, or Saint-Saëns for them. 3. Count starting with your thumb, as is customary in France. 4. When learning numbers, practice by reciting French phone numbers to students so they can see the formation. 5. Use authentic artwork or photos from French speaking countries as speaking or writing prompts. See my post on how I use Google Maps to incorporate geography into my lessons. 6. Write your 1s the French way (which look like 7s to Americans). Be sure to explain this to students! 7. Use Canadian zip codes to practice alphabet and numbers at the same time. 8. When using mobile devices, have students use the French keyboard. They will be able to see how the letters are laid out differently, but they also get the advantages of French autocorrect and predictive word guesses! 9. Doing a pen pal project? Consider snail mail (or at least a snail mail component!). In this era of digital everything, students really relish a real live piece of paper from France. They get to see French handwriting and notice other nuances, such as the "carré" style of paper commonly used. Read my post on how I do my pen pal project. 10. Got 5 minutes left at the end of class? Why not have the students sit back, relax and watch one of these beautiful videos showcasing Paris, or one of these beautiful videos showcasing the francophone world. Better yet, show them as they are coming in the door! It will inspire wanderlust! 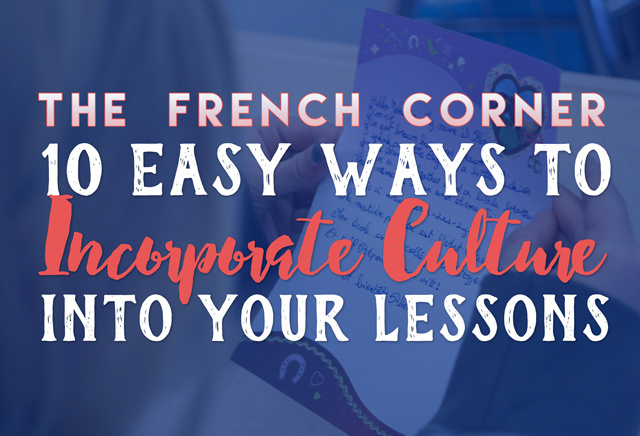 What are your favorite ways to incorporate culture into your everyday lessons?